The Via Romen ensemble, based in Charlotte, North Carolina, presents music and dances which are rooted in the Russian-Romany (Gypsy) tradition. Their music and dance repertoire originates in Eastern and Western Europe and is enriched by jazz, Jewish, and Latino styles. Via Romen enchants audiences with intricate improvisations, catchy tunes, and flashy footwork. Despite being rooted in a Russian-Romani tradition, their music is modern, innovative, and fresh. Via Romen will perform as a Trio of virtuoso musicians - Vadim Kolpakov with violinist Arcadiy Gips and fabulous dancer Marina Shanefelter. Two of the band members, Vadim and Arkadiy, were part of the Madonnas Sticky & Sweet 2008/2009 tour as part of the Kolpakov Trio. The Flying Balalaika Brothers was created by two virtuoso native Russian musicians whose combined classical training with folk traditions created a unique sound. They later brought in American musicians to enhance the band. 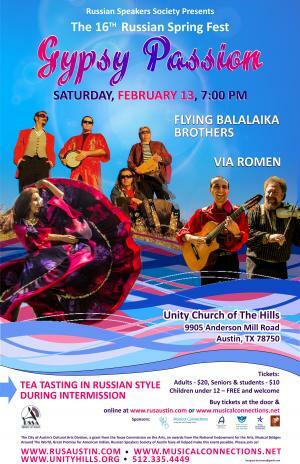 The Flying Balalaika Brothers first established themselves at small festivals such as the Gilroy Festival, Sawdust Festival, Valencia Street Market, Pecan Street Festival, Music Under the Stars, and the Kerrville Folk Festival. They now perform in concert halls around the nation. This group features vocalist Zhenya Rock, balalaika, accordion, guitar, and banjo; Sergey Vashchenko, balalaika, bass, accordion; Aaryn Russell, guitar and bass balalaika; and Chris Hausler, drums. Both of these groups perform out of a love for traditional music and classical elegance. Join us for an innovative and exciting performance. It will be a tea tasting in Russian style during intermission.